Part two of this five-part series on shopping micro-moments dives into where shopping starts: I-need-some-ideas moments. Here we explore the consumer search trends shaping these moments, what they mean for retail marketers, and how some retailers are already capitalizing on these kinds of micro-moments. Sometimes shopping happens on impulse. But other times, there's a bit more thought that goes into deciding the perfect brand, product, or style—whether that's for a purchase as small as nail polish or as large as a sofa. Let's say a young couple has been dreaming of a new kitchen. There are so many options for countertops, hardware, appliances--and more. Where do they start? Who carries styles in their price range? How do they know if it will all look good together? The same scenario could apply to apparel, electronics, or … any retail category. Source: Google/Ipsos, Consumers in the Micro-Moment, Wave 3, U.S., n=1,291 online smartphone users 18+, Aug. 2015. This is prime opportunity for retail marketers to step in and bring their brand and products into the consideration set. When it comes to shopping ideas and inspiration, we all know that online interactions play a role in influencing the ultimate purchase decision. But how much so? New clickstream data from Luth Research's opt-in panel3 (which shows the online pages a user visited) and Mindswarms mobile video surveys4 provide just that type of insight. By analyzing a shopper's micro-moments (in the form of searches, clicks, and website visits) over the course of one month, we can start to see exactly how and how much digital played a role in influencing his purchase decisions. Meet Marcus. He's 27, and from Ohio. He's a health aficionado and online educator. He uses what he learns online to develop educational video content for his YouTube channel. Over the course of the month where his online activity was observed, Marcus was interested in learning about wheatgrass and juicers. Unrelatedly, he was also shopping for a graduation gift for his girlfriend. 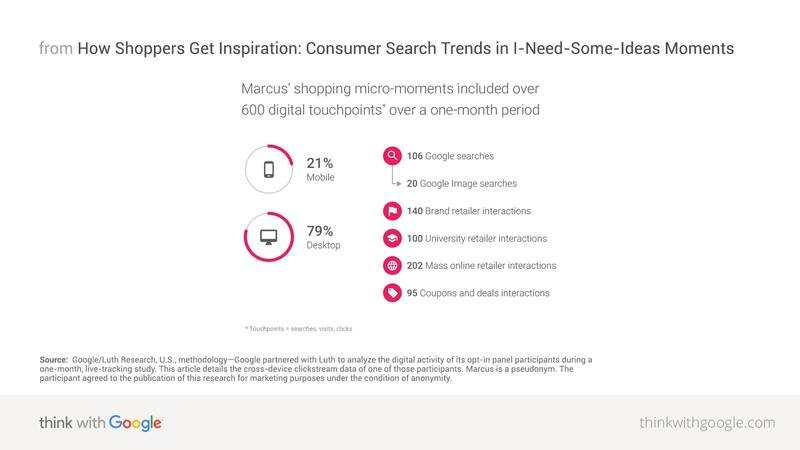 Here's a high-level look at the digital touchpoints (searches, visits, and clicks) that shaped Marcus' shopping micro-moments that month. Source: Google/Luth Research, U.S., methodology—Google partnered with Luth to analyze the digital activity of its opt-in panel participants during a one-month, live-tracking study. This article details the cross-device clickstream data of one of those participants. Marcus is a pseudonym. The participant agreed to the publication of this research for marketing purposes under the condition of anonymity. Looking at one of Marcus' I-need-some-ideas moments specifically, it's clear that his quest to learn more about wheatgrass led him down a path to then research juicers. Here's a real sample of one of Marcus' research paths that started with a search in an I-need-some-ideas moment. Source: Google/ Mindswarms, US. Methodology: Google partnered with Mindswarms to select and interview the participants of this live-tracking pilot study. The participants answered questions about their shopping behaviors and digital activity via video. At this early stage in the consumer decision journey, a brand's role is to provide inspiration and ideas with content. Here are some concrete tips for engaging people with relevant and useful content in their I-need-some-ideas moments. Ensure you show up to be considered. If you want to be included in the consideration set, you need to be there not only when people search for your brand, but also when they search on category terms related to the products you carry. 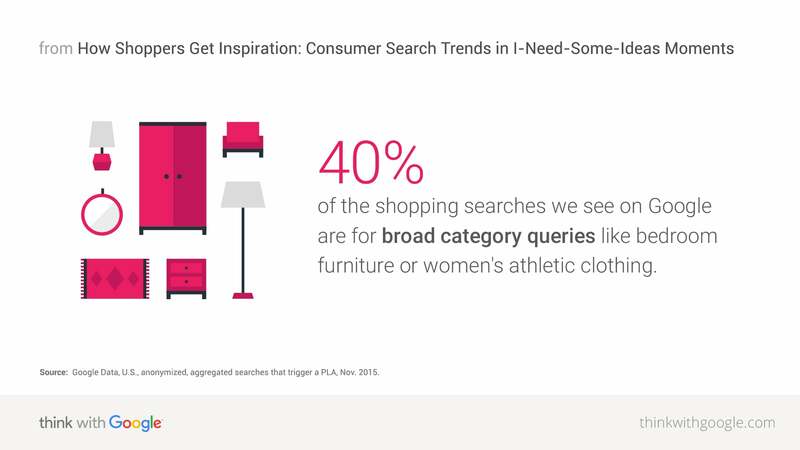 Forty percent of the shopping searches we see on Google are for broad category queries like "bedroom furniture" or "women's athletic clothing. "5 Therefore, if you sell a wide variety of sofas, for example, you should be there when people search "sofas," "sleeper sofas," "sofa beds." and "couches." Source: Google Data, U.S., anonymized, aggregated searches that trigger a PLA, Nov. 2015. 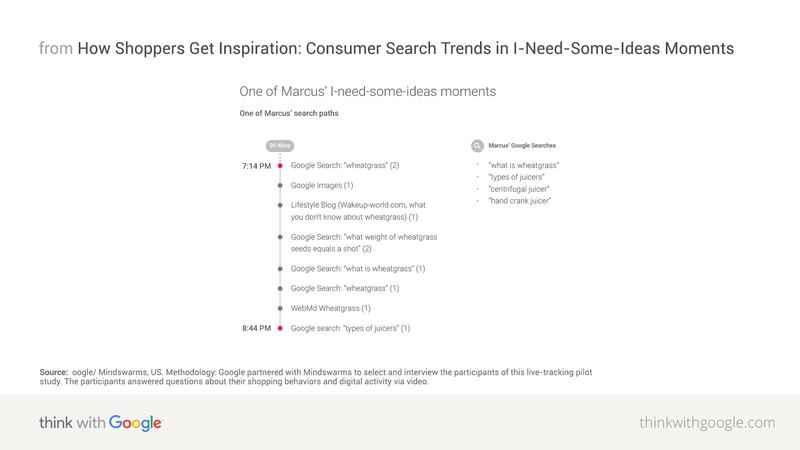 At Google we've also been tracking a steady rise in product-related searches on Google Images and YouTube where people often turn for ideas and inspiration. So it's not only when you show up that's important, but also where. Mobile design: Be sure that your mobile site experience itself enables you to be useful in I-need-some-ideas moments. Check out this guide for how to design better mobile apps and sites for retail. It includes 25 UX best practices you can follow. 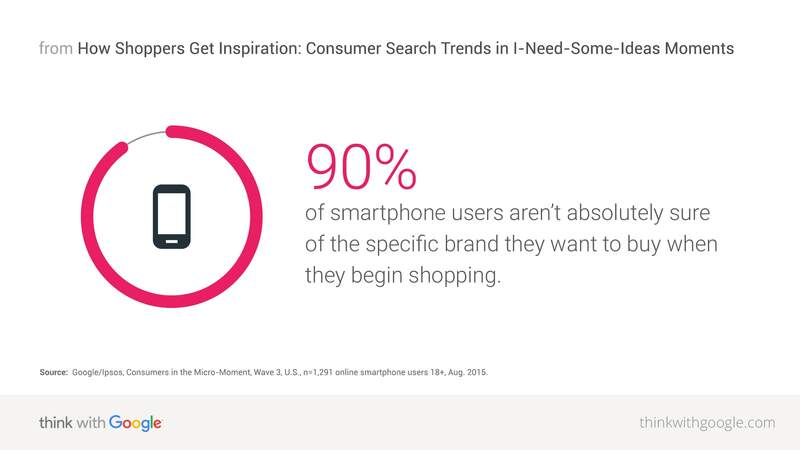 Imagery: People who search and shop on their smartphones at least once per week say that product images are the shopping feature they turn to most.6 Images are one of the quickest and easiest ways for people to get an idea of your products, so if you run Shopping campaigns on Google, ensure you're uploading quality images and relevant titles into your product feeds. Video: Creating video content for mobile that inspires and provides useful information is key to engaging shoppers. In 2015, people in the U.S. spent nearly twice as much time watching fashion and apparel shopping videos on YouTube than they had the previous year.7 When it comes to building video content, be authentic to your brand and provide utility and inspiration in ways that are unique to you. For example, if you're an apparel or jewelry brand, creating content such as "how to layer necklaces" or "accessorize a black dress" can be a way to inspire shoppers. Lifestyle icon Williams-Sonoma has always been a visual brand. It has a long history of crafting lifestyle imagery through its catalog to inspire its customers during their I-need-some-ideas moments. But the brand has had to rethink the way it tells its story. Source: Google Consumer Survey, based on U.S. online population, n=550, Jan. 2015. The catalog still has a place, but mobile phones are increasingly the new starting point for kitchen connoisseurs (especially millennials). 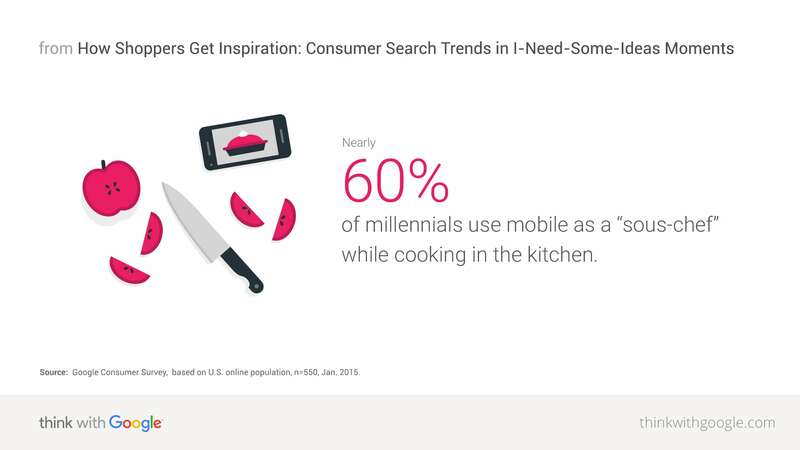 In fact, nearly 60% of millennials use mobile as a "sous-chef" while cooking in the kitchen.8 Williams-Sonoma uses video content and more visual shopping ad formats to inspire these shoppers. As a result Williams-Sonoma has seen a 70% increase in mobile sales YoY, and a 51% overall increase in e-commerce sales. There's a lot more to learn. Check out this more detailed feature on Williams-Sonoma's approach to I-need-some-ideas moments, including a video complete with an interview from Williams-Sonoma's Chief Marketing Officer. "Being there" for Swarovski used to mean showing up in seasonal moments like Christmas, Mother's Day, and Valentine's Day. But search insights revealed the opportunity to engage people in more everyday inspirational moments, like when they're wondering how to accessorize an outfit. Since 50% of Swarovski's site traffic comes from mobile, the brand focused on developing mobile content that's visual, inspirational, and easy to navigate. The brand's interactive Style Finder offers ideas for how to accessorize a look for work or that special date night, and allows the customer to dial-up or dial-down a look, depending on her mood. By meeting customers on mobile as they search for inspiration, Swarovski has grown its online sales by 50% year over year, with mobile sales growing more than 150%. There's a lot more to learn. Check out this more detailed feature on Swarovski's approach to I-need-some-ideas moments, including a video complete with interviews from the people driving this thinking for the brand. 1 Google/Euromonitor International, retail micro-moments, U.S., apparel, consumer electronics, home & garden mobile shoppers, n=500 for each category, Jun. 2016. 2 Google/Ipsos, Consumers in the Micro-Moment, Wave 3, U.S.,, n=1,291 online smartphone users 18+, Aug. 2015. 3 Google/Luth Research, U.S., methodology: Google partnered with Luth to analyze the digital activity of its opt-in panel participants during a one-month, live-tracking study. This article details the cross-device clickstream data of one of those participants. Marcus is a pseudonym. The participant agreed to the publication of this research for marketing purposes under the condition of anonymity. 4 Google/Mindswarms, U.S, methodology: Google partnered with Mindswarms to select and interview the participants of this live-tracking pilot study. The participants answered questions about their shopping behaviors and digital activity via video. 5 Google Data, U.S., anonymized, aggregated searches that trigger a PLA, Nov. 2015. 6 Google/Purchased Digital Diary, "How Consumers Solve Their Needs in the Moment," shopping features include the following: engage with advertisements or messages from a business (click, watch, etc. ); check product availability online or in-store; read reviews from other shoppers and experts; watch online videos about the product or service; look at product images for the product or service; use discounts or offers for a product or service; contact a store about a product or service; view store locations on a map; smartphone users=1,000, search and purchase on smartphones weekly=736, May 2016. 7 YouTube Data, U.S., classification as a shopping video was based on public data such as headlines, titles, and tags, etc., and may not represent all apparel shopping videos on YouTube, Sep. 2014 vs. Sep. 2015. 8 Google Consumer Survey, based on U.S. online population, n=550, Jan. 2015.